The need for sanitation services in developing countries is a major environmental and health issue worldwide because by far, the biggest water pollution problem in the country today is untreated domestic sewage. The World Bank estimated in 2003 that over 90% of the sewage generated in the country is not properly treated and Manila ranks second to the last among Asian Cities in terms of sewerage services. Only six (6) out of 115 cities in the Philippines have sewerage systems and Naga City is not one among those cities. To prevent casualties due to water pollution and water-borne diseases, the Metropolitan Naga Water District (MNWD) made a decisive action by proposing a septage management system program that in the long run will benefit not only its consumers but also the environment. The Philippine Clean Water Act of 2004 (R.A. No. 9275 – An Act Providing for a Comprehensive Water Quality Management and For Other Purposes) specifically provides that the agency vested to provide water supply and sewerage facilities in areas not considered as highly urbanized cities (HUCs) as defined in Republic Act No. 7160, in coordination with LGUs, shall employ septage or combined sewerage – septage management systems. The MNWD Septage Management Project has a general aim to integrate water quality management pursuant to the provisions of the said Clean Water Act for economic growth in a manner consistent with the protection, preservation, and revival of fresh, brackish and marine waters. The project shall cover all buildings and structures whether public or private, residential or commercial with service connection provided by the MNWD. All houses/buildings shall have an approved wastewater disposal system for primary treatment of domestic sewage. Liquid and/or solid materials removed from septic tanks shall be transported and disposed by accredited septage hauler/pumper or by the MNWD septage hauling system, following the Department of Health (DOH) regulations on desludging, transport, and treatment of sludge. No septage hauler/pumper can unload or dispose of septage in any place, including bodies of water, agricultural fields, and the drainage system. Enabling local ordinances by respective Local Government Units (LGUs) within the MNWD service coverage were passed in support of the national law, the Philippine Clean Water Act of 2004. The essential Public Hearings were conducted in Magarao, Camarines Sur last June 30, 2015; for Canaman, Camarines Sur and Camaligan, Camarines Sur last July 1, 2015; for Naga City and Gainza, Camarines Sur last July 2, 2015. On June 21, 2016 the Naga City Wastewater Management Board (WMB) endorsed to the Sangguniang Panlungsod the proposed septage fees and on August 23, 2016, Naga City Sangguniang Panlungsod passed Resolution No. 2016 – 316 endorsing WMB Resolution no. I series of 2016 to the Local Water Utilities Administration (LWUA) for its favorable consideration. MNWD consumers (Uniform Rate) – P 1.53/m3 billed or consumed water per month. 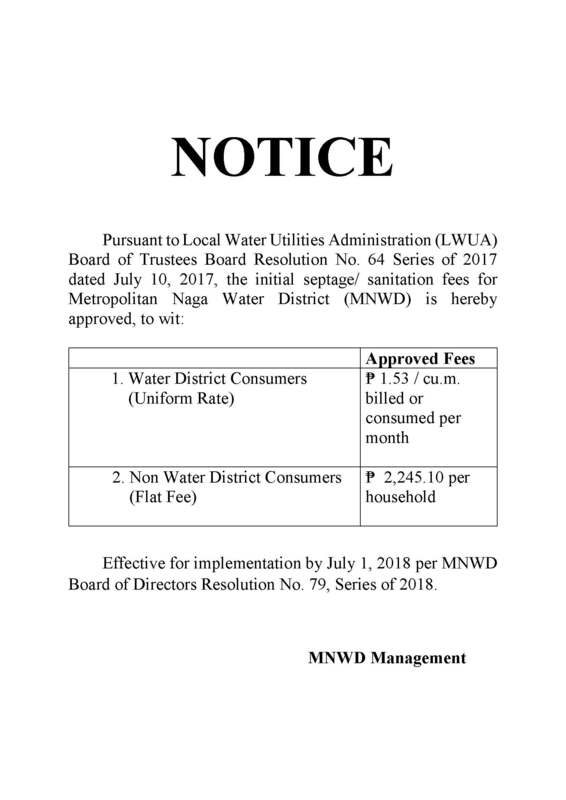 Effective for implementation by July 1, 2018 per MNWD Board of Directors Resolution No. 79, Series of 2018.